Every incident down memory lane with this great-grandma was about co-existence and togetherness. 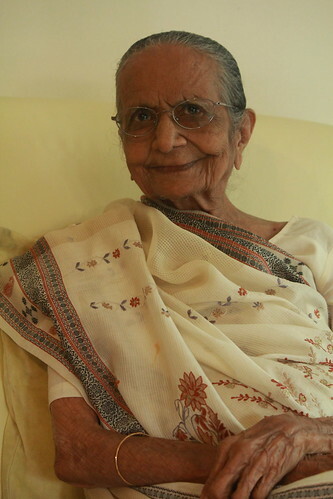 At 88, more than anything else, she misses the sisters-in-law (jethani) with whom she lived after her marriage. She does not think that in adjusting with each other, they were compromising on any happiness. The joy of sharing life made every sacrifice worthwhile. No wonder then, Smt Hasumati Manilal Shah’s residence in the heart of Chennai is named as ‘punya nivaas’ (meaning blessed home), because such a large-hearted understanding of life is in itself a punya. A mother of 2, grandmother of 4 and great-grandmother of 3, Hasumatiji enjoys living with the next three generations under one roof. “She neither compromises on what she wants nor does she impose any restrictions on what others want,” states her niece Kirtida Shah, an Ashtamangal meditator, who speaks of this mother-like aunt all the time. It was her description of her aunt that made me visit this sprightly and cheerful great-grandmother and pay her a tribute by featuring her in this column. 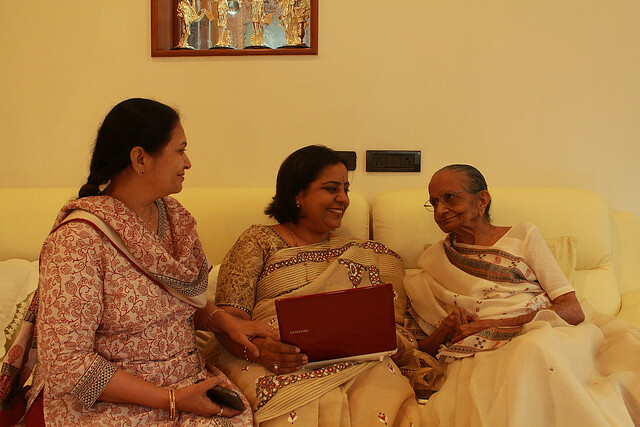 We meet up for a lively chat at her residence in Chennai. Namaste Hasumatiji. Tell us about your childhood. I was born in Bhavnagar (Gujarat) in 1925 in a Gujarati family. I studied up to eighth standard. At that time, my maama passed away. My mother had to visit her maternal family for a while. In her absence, I started taking care of the house and hence discontinued my studies. Did housework keep you very busy at that tender age? Not really! I also learnt many extra-curricular activities along with my friends. I was a good sport and enjoyed running, yogasana and lathi-khel (stick fighting). There was no running water in our area and I learnt to fill water from the well and balance one pot on top of another. Your son told me that you were involved in India’s freedom movement. In 1942, many of us became involved in our own small ways with the freedom movement inspired by Gandhiji. I even remember how we were arrested for one night because of a morcha (picketing). At that time, there was a bout of malaria in Bhavnagar; so many of us went about distributing bottles of quinine within the locality. We also learnt to spin khadi. In fact, I gave up wearing silk. Over the years, I don’t like even wearing jewellery. Whatever I had, I have distributed it among the children. Those years around 1942 sound like precious memories and moments of pride. When did you move to Chennai? A few years after my marriage to Shri Manilalji Shah in 1947, we first moved from Bhavnagar to Bangalore. But I did not keep well and suffered from Asthma. Therefore in 1961, we moved to Chennai. In your experience, what is the difference in family structure over the years? Deesha (grand-niece): She finds it strange that these days, every child in the house has his/her own set of toys. Back then, children were happy to play with hand-down toys and clothes. I don’t even think they had a notion of ‘my toy’ or ‘my things’. Hasumatiji: This is true of how our children grew up. We shared everything, including the children. Between me and the other bahus at home, whoever was free would breast-feed not just her own baby, but the other baby as well. Once when a jethani of mine became unwell and was in a critical state, I went in to see her. I remember weeping and telling her not to worry about the children. I can never forget the look of gratitude and solace on her face at my words. She passed away soon after, leaving behind seven children whom I brought up as my own. I think those days we treated family members as our own. Kirtida: Yes, that’s how she has been – a mother to all of us. She has imparted excellent values to her children. Her son is an embodiment of Shravan Kumar (the epic character from Ramayana who was notable for his devotion towards his parents). All of them share a relationship of affection and mutual respect. That sounds like a good set of family values. How do you keep busy now? Hasumatiji: I wake up at six every morning, filter my water pot and make an ukkala (a hot beverage made with spices and water) for myself. I then have a bath and start my pooja. I enjoy reading religious books and chanting. It keeps me busy as well as happy from inside. I clean my room and keep it the way I like it. I also enjoy reading the newspaper. Sanskruti (grand-daughter-in-law): She likes to be aware of current market and political updates. She is very disciplined and follows her routine every day. But she does not impose it on us. Perhaps she has the serenity to explain values rather than impose them as rules. Tell me, what is the secret of such equanimity? Hasumatiji: ‘Let go’ is the mantra of happiness in a family. Give them your opinion but also give them the freedom to do what they think is right. Pradip Shah (son): Yes, she will inform us about the religious days. But she allows us to decide if we wish to observe them. One quality I truly admire about her is that she never corrects any of us in front of each other. She talks to each of us separately. And then, she lets go. Sanskruti (grand-daughter-in-law): She is really broad-minded and accepting. As a family, they have a cosmopolitan outlook and have easily accepted changing times. In fact, my mother-in-law, Mrs. Sona Shah, breaks the monotony of the typical Indian housewife. She is her own person and allows us the same freedom. Hasumatiji, your family is full of praise for your culinary skills. They just took me to the pantry where I saw some delicious pickles prepared by you. Ami (grand-daughter-in-law): Oh yes, even today, she closely supervises the making of pickles. She makes a mango pickle which is rich with the flavor of jeera. It is known as ‘jeera kairi’ and is a family favourite. Hasumatiji: I have always enjoyed cooking. I have some beautiful memories of cooking with my jethani. As soon as the mango season began, we would make so many varieties of mango pickle – sweet, spicy, mixed flavours. I also believe that there is nothing as tasty as a home-cooked meal. We are Jains, so I don’t use root vegetables such as onion, potatoes and garlic. Kirtida (niece): Yet there is no compromise in taste when she prepares something. I still remember when we used to make Diwali sweets at home. I learnt to make ghugra from her. It is a sweet dish with a perforated edge made by twisting the dough. She taught me to make the perfect edging. Even if it was a little imperfect, she would say ‘na chaale’, and make us repeat until it looked like a piece of art. She saw us off at the gate, defying her age, standing straight and tall, waving us good-bye with an affectionate smile. First published in Jan 2014 in Harmony – Celebrate Age Magazine for the column – The Great Granny Diaries. Part-2 of this post is Lila Pulav, a simple tasty rice dish from the kitchen of Hasumati Shah. She is the 17th grandma featured in this column.